Story Massage combines the benefits of positive touch with the fun and creativity of words – whether as story, rhyme or song. Ten simple massage strokes form the basis of the programme. These strokes have a name, such as The Circle or The Sprinkle, and an easy to recognise symbol making it fully accessible for all ages and abilities. 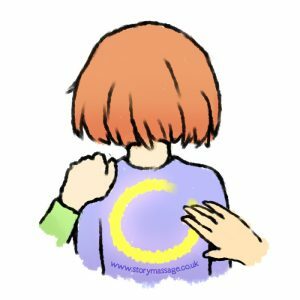 Story Massage can be shared as a child to child or parent to child activity or with adults. It is popular in a variety of settings including schools, special schools, care homes, after-school clubs, family centres, hospices and of course, the family home. Do take a look at our blog for examples of Story Massage in action. The ten strokes can be used on any area that is accessible and appropriate for the person so it can be applied to the shoulders, back, arms, head, face, legs, hands and feet, all areas which are non-intrusive. No oil is used so clothes do not need to be removed. Movements are safe and can be adapted to suit varying personalities and temperaments. Positive touch through storytelling can be especially beneficial for children and adults with additional needs. There is also an educational element as Story Massage can be used to fit in with the national curriculum. Many children have learnt their numbers and letters, and elements of history, geography and nature through massage stories. 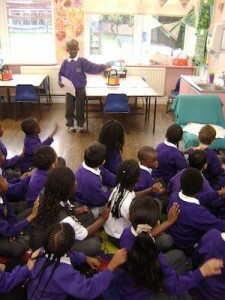 Story Massage offers a way of learning and communicating through play and positive interaction. 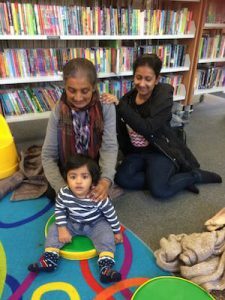 You can adapt your own massage stories from favourite stories and nursery rhymes, or have fun creating your own stories to reflect particular interests, activities or events. Below is a massage story created by children in a Nurture Group to celebrate a child’s birthday. “The creative and literacy benefits for the children are limitless. It is easy and effective to link Story Massage into our topic and curriculum as a whole school approach." “Story Massage offers a gentle way of sharing positive touch with children with PMLD. So often touch is purely functional and it is lovely to see the children having fun and engaging."